Come join us at the Maker Fest 2016 and be inspired by Maker Activities from various departments. Students will demonstrate research projects, faculty will host events, guest performers will introduce new ideas and curriculum. Fun will be had, new skills will be introduced, and connections will be made. There will be ice cream, pizza, 3D laser scanners, social robots, problem solving drones, Russian video games, smoking dresses, live coded music, and lots more to spark creativity and making. The Maker Fest is sponsored by The Andrew W. Mellon Our Shared Humanities Grant, designed to encourage interdisciplinary work across academic fields. Art History classes will tell you that the Readymades or Found Objects Movement in Art took things from our mundane worlds, and recontextualized them as Fine Art. For this Hackathon, Professor Orellana will take things another step and ask you to recontextualize electronic or robotic media, for example, Elmo. He will spend the morning teaching everyone about the electronics, then hackers will take apart their found robots and make new things. At 4pm, the items will be put on display for other Maker Fest attendees to see. There are many applications where drones can solve problems or improve research. They can even speed up live saving rescue efforts. During Maker Fest 2016, students, faculty and staff are invited to attempt our drone obstacle course. The obstacle course will highlight some of the benefits of drone building and flight. Participants can register for time slots to attempt the drone course throughout Maker Fest on 10/7. This workshop has been designed to investigate the theory and practice of Animated Music Notation. Attendees will be encouraged to participate in a series of hands-on explorations of a variety of animated score functionalities. The workshop has been designed to encourage discussion throughout and upon their completion. Workshop attendees are strongly encouraged to bring instruments, although this is by no means necessary. 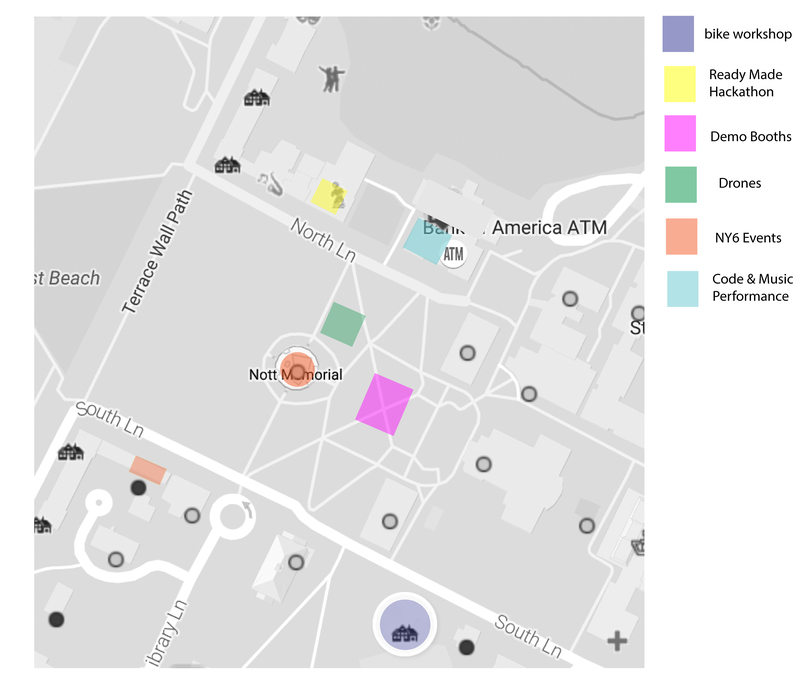 The MakerWeb Consortium is a group of labs dedicated to Maker Culture. We have 3D printing, laser cutting, prototyping, electronics, sewing, and lots more. 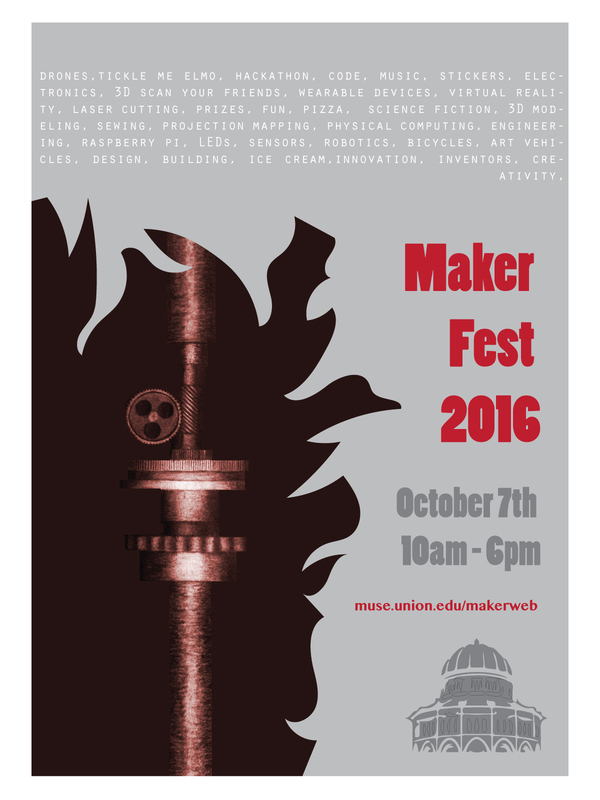 This tour will take people to each of the labs and talk about how they can get access to all of the Maker resources Union has to offer. If you’ve wandered by wondering how to get access, this tour will explain all of this. We will meet on the steps in front of the library at 4pm sharp. Please be on time, there’s lots to see! For more information, and to register for specific events, please watch our website, facebook and twitter pages.